All of us have a history, and the Christ, of course, was no different. His genealogy is listed in Matthew and again in Luke. Since the two genealogies are quite different, one of the genealogies must be that of the father, and the other, that of the mother. Generally, Matthew is considered to be the lineage through Joseph and Luke, the linage through Mary. Our focus in this short reading, though, tends more toward some of the implications of the genealogy found in Matthew. By that I mean, if we look at the genealogy as evidence of a claim, we might come closer to understanding why the gospel of Matthew opens as it does. One of the immediate implications, of course, is that Christ was the legitimate heir of David, and therefore, of royal blood. God had made a promise to David that the Christ would be his heir, and as heir, he would be known as the descendant of David (II Sam. 7:12-16; Isa. 9:6, 7; 11:1-5; Jer. 23:5, 33:15-18.) This claim, of course, is repeatedly made by Christ himself, and not once did any of his enemies dispute that claim. The best they could say was that he was illegitimate. Even if that assertion had been true, he still would have been of royal blood through his mother, Mary. In arguing that Christ is the son of David, Matthew makes an even more profound implication. If Christ is the promised descendant of David, he would also be the promised descendant of Abraham. David, of course, had many descendants and so did Abraham. God, in fact, had promised Abraham that his descendants would be as many as the stars in the sky, but one descendant in particular would be the full realization of the promise God made. In that descendant, God would work his plan: “In thee shall all the nations of the earth be blessed.” Matthew’s claim is that this child is the very fulfillment of that promise made by God centuries and centuries before. Yet, there is more. If this child is the descendant of anyone in the past, he would also have to be fully human. He could not be a phantom, or some mere copy of a man. No, he would be fully human with both a birth and a death. All genealogies, after all, record both births and deaths. In this respect, Matthew’s record is no different. If Matthew opens with the birth of this child, he will close with the death of the same child as a man. However, as with the birth of this child, so with the death of this man— in both events something wonderous and inexplictable happened that had never happened before or since. The irony of it all is that at his birth, someone sought his death, and at his death, someone sought to keep him from being born. He may have been born to die, but he died so that all men might be born again. Death could not destroy him at his birth, and death could not destroy him at his death. The lineage of this child, though, tells us that he is not the product of his lineage. Here, once again, there is another inexplicable paradox. Neither his environment nor his ancestry could account for him. 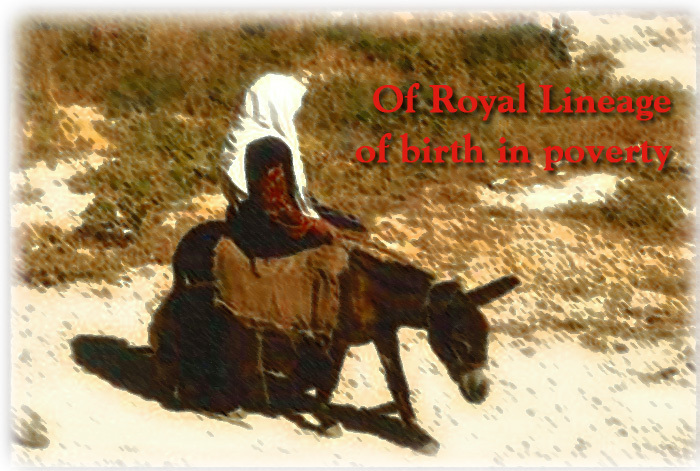 Both Joseph and Mary were poor with limited resources. Nothing in the early life of this child could account for the man he became. Even as a young boy, he would astonish the Temple scholars who listened to him. As a man, no one could counter his arguments. In the last week of his life, he would silence both the Sadducees and the Pharisees and would do so in public. the significance of the genealogy.) Ruth herself may have been morally pure, but she was from Moab, and as for Bathsheba, her adultery with David led to both the ruin of her husband and David. If the enemies of this child would later seek to describe him as a common illegitimate child, it could also be said that his past was sordid nearly from the time of Abraham forward. Indeed, many of the kings who were his ancestors practiced blatant idolatry. There was every reason to believe that Mary could have been no better than her ancestors, but there was every reason to believe that this man could not have been the product of his lineage. He was different, and so was Mary. Like her child, she stood in stark contrast from the lineage that preceded her. And yet, she watched him die an agonizing death, knowing all the while that she could have prevented that death by naming the man with whom she supposedly had had an affair. This child, though, was not born out of wedlock, but Joseph was not his father. Joseph himself knew that this child was not his son. He began the proceedings to divorce Mary privately. At least, such were his thoughts. The silence of Mary at the cross is evidence that her son was all that he had claimed to be. Everything he had said was true.